This modern rock band out of Washington D.C has released their second offering entitled "Another Night In Normalville." This is an EP with 4 songs that demonstrate their ability to mix it up. Unlike some bands that can become stagnant in their approach, Euphoria clearly knows how to produce a sound that won't bore you to tears. The band consists of four players: Jon Bumbrey (drums), Shane Heselius (vocals and guitar), Eric Kern (keyboards and vocals), and Dan Aylestock (bass and vocals). While this band's sound does resemble "modern rock" and can be lumped into some of the groups of the mid and late 90's, I have to say these guys have the capability of stepping out of that top 40 pop costume party. 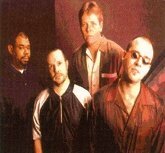 The first song on their EP, "F.Y.98", has a very routinely popish feel to it. This isn't a bad thing. The vocals are strong and the music is good. I wouldn't mind listening to it on the radio or in a club. They do up the modern rock sound very well. But I'd like to see them jump into that heavy metal punk rock arena. The next song, "One Cigarette", is awesome! With drop dead throbbing guitar work and a heavy sounding rhythm accented with excellent vocals, this song is one fine rocking winner! I like it so much I keep listening to it over and over again. It has that Metallica/Alice In Chains/Nirvana touch that makes it my favorite tune on this EP. "Normalville" goes back to the modern rock sounds, with light acoustics and harmonica and a moderate melody that wells out for a moment or two with heavy riffs. Nicely done. The fourth song, "Silhouette" kinda gives you a little of both pop and rock in all the right proportions, with a quick tempo that chills out and comes back with tailored guitar work and smooth vocals. 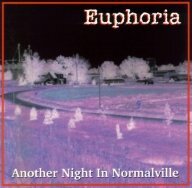 Euphoria's music is mature and very flavorsome, and they know how to pound out a heavy tune and make it intoxicating. I would love to hear more of their music. Their first release is "Grin", and I'm going to have to get my hands on it+..fast. I suspect that this band would be a thrill to see live. If you hear that Euphoria is in your area, go see them. Please email me and let me know how they were. I request this because someone was nice enough to see a band that I reviewed a while ago, and they emailed and told me that particular band was great live. I feel bad because I lost that person's email address and I never got a chance to say thanks for letting me know. I give "Another Night In Normalville" a B+ and consider it to be music on the brink of greatness.